89 Comments	This post may contain affiliate links. 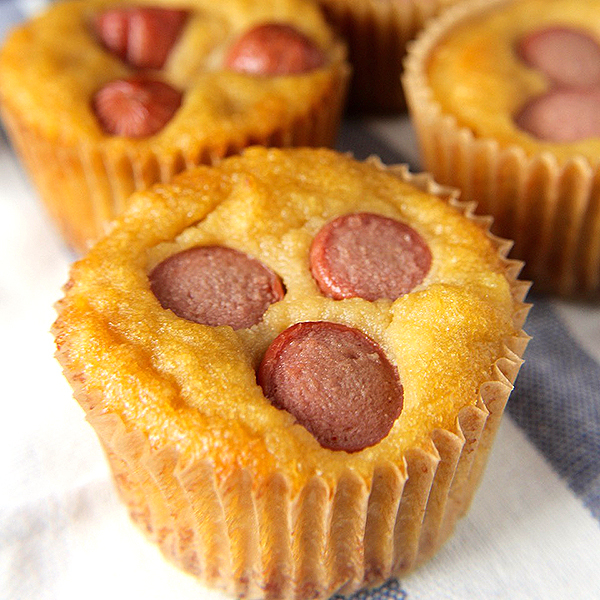 These Paleo Corn Dog Muffins are a healthy take on a childhood favorite. Gluten free, dairy free, easy, and so good! You will love them! I have always loved corndogs, but I’m slightly afraid of deep frying. I can pan-fry, but a big pot of smoking hot oil terrifies me! So these baked muffins are the solution to my oil fears. 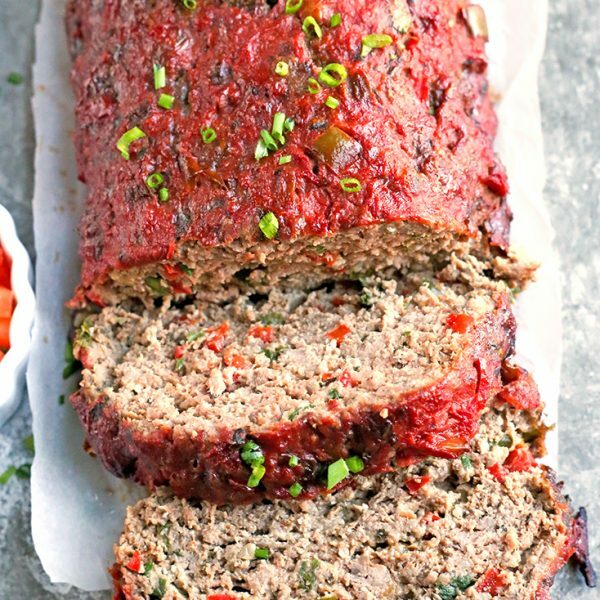 Baked in a pan, in under 30 minutes, with no chance of grease splatters. 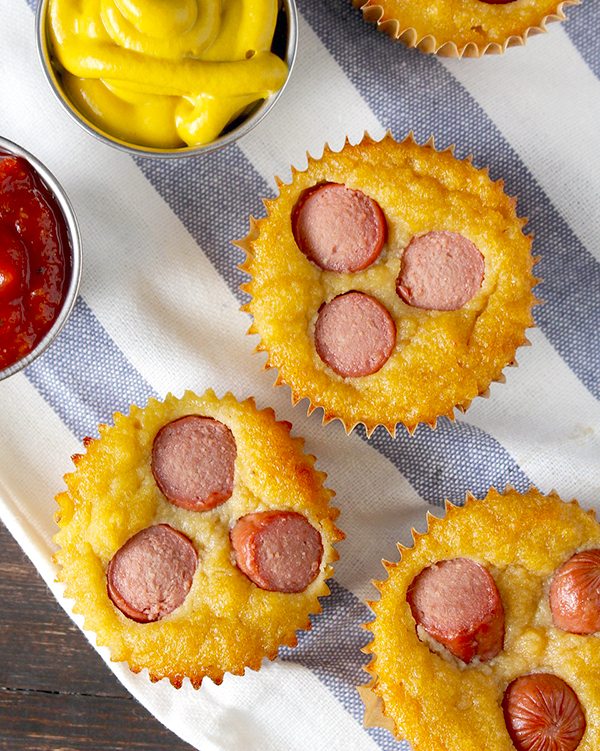 I have seen so many versions of corn dog muffins on Pinterest, but they mostly use cornbread from a box and cheap hotdogs. I thought that it would be a fun recipe to make-over and I’m so glad I tried it! These are made gluten free, dairy free, and grain free. 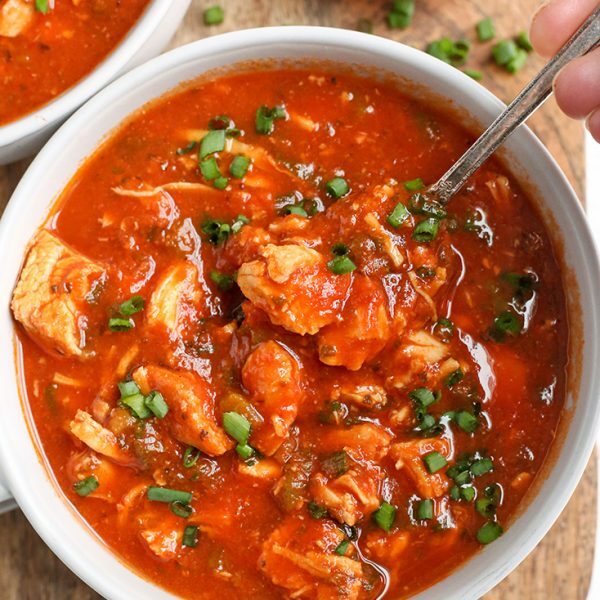 They are so easy, fast, and delicious! Definitely a meal I’ll be making over and over. The “cornbread” contains no corn, but has the same texture and slight sweetness. It’s a mixture of coconut and almond flour that creates the perfect cornbread replica! The ghee makes it buttery and the honey adds the sweetness. 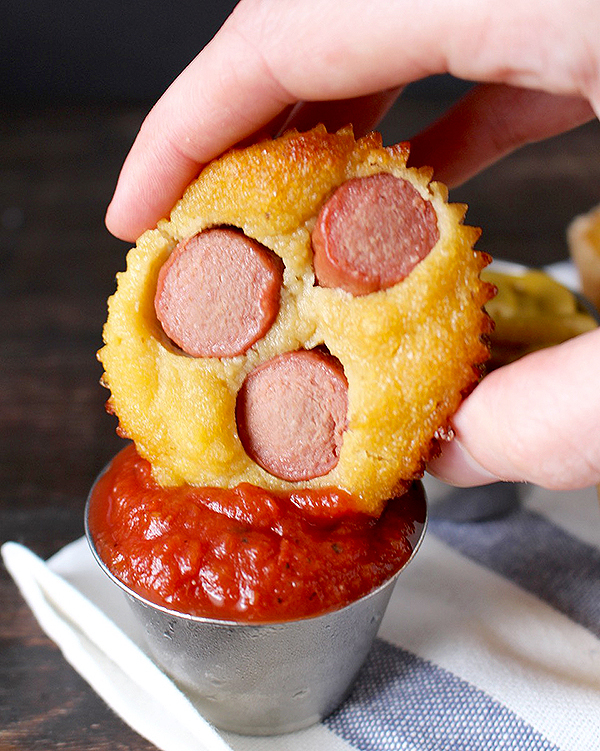 Paired with the savory hotdogs, they make the perfect bite! I used Applegate Uncured Hotdogs that are nitrate free and what I consider a healthy hotdog. These not only make a great quick dinner, but they would be perfect for packing in a kid’s lunch. I served them with my homemade ketchup and some mustard. My husband also thinks they’re good on their own though as well. 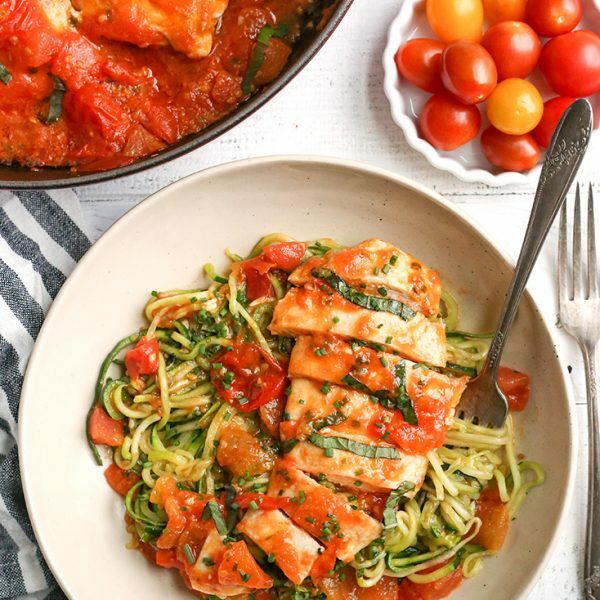 You will love how these are so easy and make a great quick meal. They will take you right back to childhood! And the Super Bowl that’s coming up?? These should be added to the menu. They are hand-held, dip-able, delicious, and can be made ahead. I think that meets all the criteria for Super Bowl food. Enjoy!! Cut each hotdog into 6 pieces and set aside. Preheat oven to 350° and line a muffin tin with 10 parchment paper liners. Set aside. In a large bowl, combine almond flour, coconut flour, ghee, coconut oil, honey, almond milk, eggs, salt, and baking soda. Mix util fully combined and smooth. 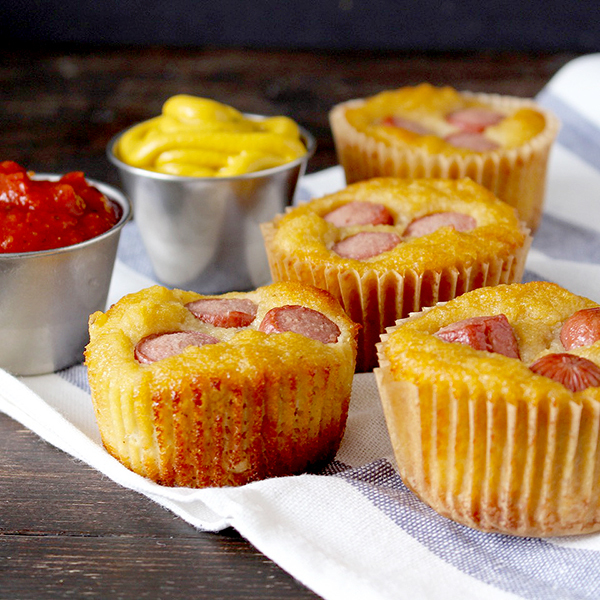 Divide evenly among the 10 muffin tins then top with 3 slices of hotdog each. Bake for 25 minutes. Serve with ketchup, mustard, or chili. Love these!! Super yummy and easy to make. My toddler ate them too! Thanks for trying them, Ana! So glad you guys like them! I had a party to go to and I always volunteer to bring an appetizer because I have celiac and can’t eat most of the snacks people bring. 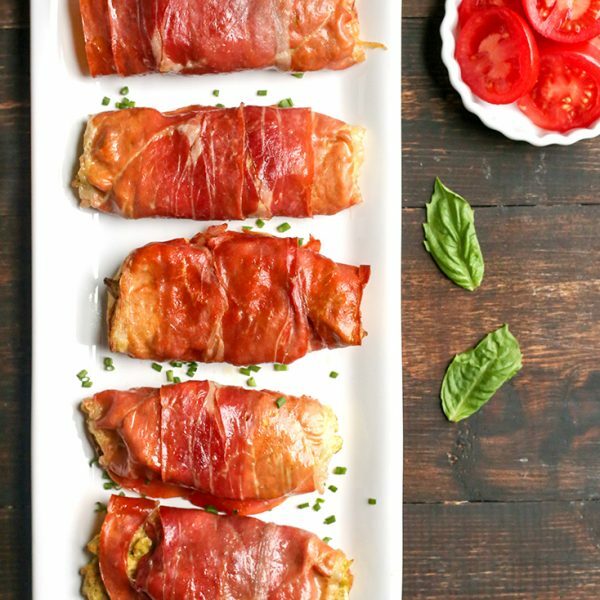 I just started doing paleo too, so these were perfect! I ended up making mini muffins instead, with one piece of hot dog. I baked them for 17 minutes and they were a big hit! I didn’t come home with any. I’ll definitely make the big version for my husband and I for dinner sometime! Thanks for trying them, Jenny! I’m so glad they were enjoyed 🙂 I love the idea of making them snack size- fun!